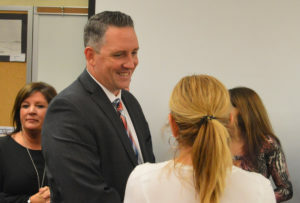 Michael Harkin was officially welcomed into the East Greenbush Central School District on Wednesday evening when he was appointed Columbia High School’s next principal at a special Board of Education meeting. He will start on December 29, succeeding Principal John Sawchuk who is retiring. Mr. Harkin is currently the principal of Knickerbacker Middle School in the Lansingburgh Central School District. He met with Mr. Sawchuk at Columbia earlier on Wednesday and plans to visit three more times before his official start date so he can become more familiar with the school and staff. Mr. Harkin has 12 years of administrative experience as a principal and athletic director. He has served as principal of Knickerbacker Middle School since 2014. Prior to that position, he was the director of physical education and athletics at Lansingburgh from 2007-14 and director of athletics at Brunswick (Brittonkill) Central School District from 2005-07. Mr. Harkin began his career as a physical education teacher at Thomas O’Brien Elementary School in Albany in 1999. He has a bachelor’s degree in physical education from Canisius College and a master’s degree in educational administration from The College of Saint Rose.